Home » We Want You to Look as Good as You Feel! We Want You to Look as Good as You Feel! We are so excited to announce that BioBalance Health, the area’s exclusive Bellafill® Bella-Diamond Provider – among the top 1% of Bellafill Providers in the US. Our expert aesthetic nurse practitioner, Abbie Calabio, is a trainer for their parent company, Suneva. Abbie trains Nurse Practitioners and Physicians across the entire Midwest on how to perform Suneva’s aesthetic treatments. This means that we are offering the best of the best when it comes to face sculpting! If you have ever had any type of injectable or dermal filler done, you know how important the artist behind the treatment is. Someone without the right amount of experience and/or talent can take an amazing product (even Bellafill®) and deliver unnatural results. Face sculpting is an art. Abbie Calabio, our lead aesthetic nurse practitioner, is the best in her field. We’re not the only ones that think that, even the makers of these dermal fillers trust her to train other professionals on how to use their product. She uses her talent, acquired skill, and vast experience to carefully take years off of your complexion, while maintaining a natural look and feel. Abbie is a board-certified Aesthetic Nurse Practitioner who specializes in medical aesthetics. That means she has the background and knowledge to fully understand the way these products interact with your skin and health. In addition, Abbie believes in establishing long-term relationships with her patients. This is evidenced by her extremely loyal and strong following of patients that she has treated for nearly a decade. 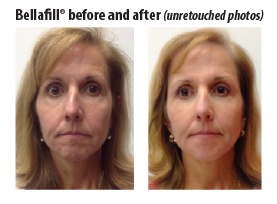 One of our favorite products offered at BioBalance Health is Bellafill®: a dermal filler that helps fill in wrinkles and fine lines. Bellafill® is different from temporary injectable wrinkle fillers because it is not made from synthetic materials that are broken down and absorbed by the body. It provides the support your skin needs for natural wrinkle correction with long-lasting results. Along with being the longest lasting dermal filler currently available, it has also been approved by the FDA for treatment of acne scars. The way that Bellafill® works is that it adds volume to the skin, lifting and smoothing out the pitted acne scars to the level of the surrounding skin. This treatment is done through a simple, in-office procedure with minimal to no downtime. The best part is that the results last up to 5 years. If you are new to cosmetic aesthetics, you may feel nervous and unsure about these procedures. Perhaps you have read stories and photos that showcase the different ways these procedures can go wrong or look unnatural. We are here to answer your questions and ease your concerns. We invite you to join us on February 6th for an opportunity to meet with our Bellafill® consultants and learn more about the process. They will help give you peace of mind about trying cosmetic injectables for the first (second, third, or hundredth!) time. These free consultations with the experts are available on a first come, first serve basis. If you are tired of looking older than you feel, or if your acne scars are keeping you from feeling like yourself, we challenge you to take the first step and RSVP to participate in this free conversation. This appointment also qualifies you to take advantage of the biggest special we have ever offered on Bellafill with which you can save $799!